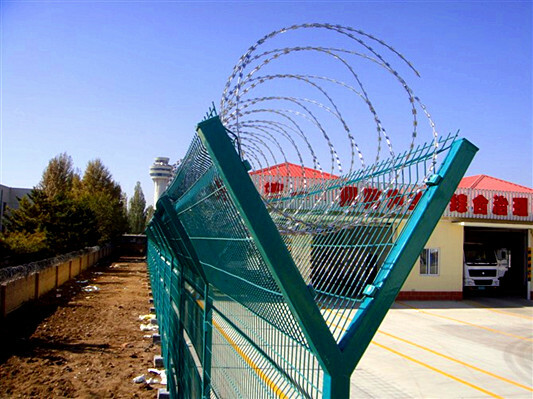 If add razor barbed wire on top of airport fence, razor barbed wire greatly enhanced safety protection, adopt electro galvanized, hot dipped galvanized, PVC coated or PE coated to anti corrosion, has the features of anti-aging, anti-sunshine, durable. Its appearance is attractive, and its design and color is various, have both fence effect and beautify effect. Because of its high safety, good anti-climb feature, SBS capture, effective prevention of artificial disassemble and crosswise four bending dabber, so its surface strength is greatly enhanced. Specifications: adopt 5.0mm high strength low carbon steel wire to weld. The V type dabber could greatly increase its impact resistance. Post is 60X60 rectangle steel, on which weld V type holder, or adopt 70mmX100mm hanging connect post. All are high quality polyester electrostatic powder spraying after hot dipped galvanized, color is international popular RAL. Surface Treatment: electro galvanized, hot dipped galvanized, PVC coated, PE coated. 1. It has the features of beautiful, practical, convenient for transportation and installation. 2. Installation can not be influenced by hypsography, connect position with post can be adjusted according to surface relief. 3. add dabber at the four bends cost not too much but remarkably increase strength and beauty, it is currently one of the most popular isolation mesh. Main Market: airport close, private districts, military restricted area, factory fence, development zone isolating mesh. Produce Process: pre-straight wire, cut, pre-bend, weld, inspect, frame, destructive test, beauty (PE, PVC, hot dipping), pack, send to warehouse.